Biological invasions are a growing problem worldwide. 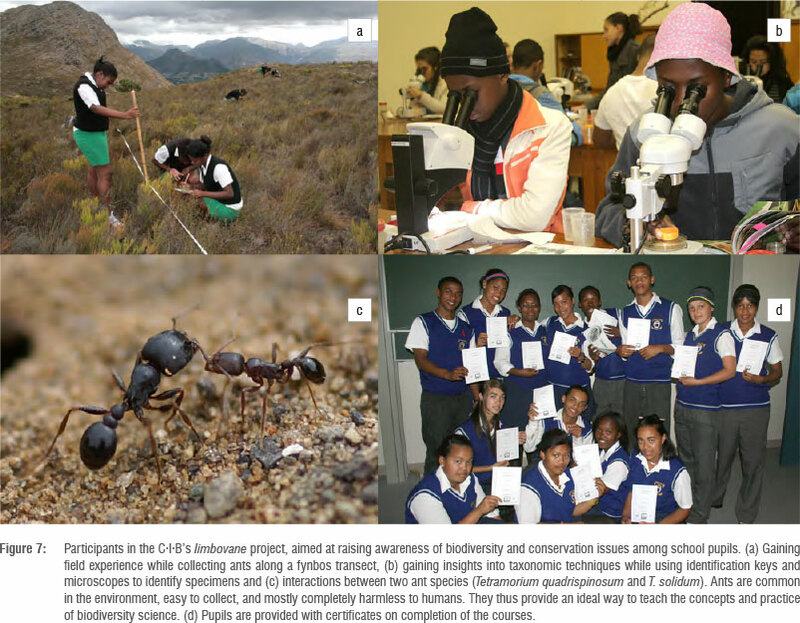 In 2004, the South African Department of Science and Technology, through the National Research Foundation, established a Centre of Excellence for Invasion Biology, with the primary goal of providing scientific understanding and building capacity in the field of biological invasions. South Africa is an extraordinary natural laboratory for the study of biological invasions, and the Centre for Invasion Biology (C-I-B) has capitalised on this situation. During its first decade, the C-I-B generated over 800 publications, and produced almost 200 graduates at honours, master's and doctoral levels. The C-I-B has therefore made a considerable contribution to building human capacity in the field of biological invasions. Substantial advances have been made in all aspects of invasion science, which is not limited to biology and ecology, but includes history, sociology, economics and management. The knowledge generated by the C-I-B has been used to inform policy and improve management practices at national and local levels. The C-I-B has emerged as a leading institute in the global field of invasion biology, with several unique features that differentiate it from similar research institutes elsewhere. These features include a broad research focus that embraces environmental, social and economic facets, leading to a diverse research programme that has produced many integrated products; an extensive network of researchers with diverse interests, spread over a wide geographical range; and the production of policy- and management-relevant research products arising from the engaged nature of research conducted by the C-I-B. Invasion biology is a branch of science that addresses the causes and consequences of introducing alien organisms to new environments, where some are able to persist and spread unaided, often with substantial negative consequences. The invasion of natural and modified ecosystems by alien species is a growing problem worldwide.1 The ongoing and accelerating redistribution of species for agriculture, forestry, horticulture, recreation and the pet trade provides a pool of alien species from which invasive species are recruited. The magnitude and diversity of opportunities for accidental introduction have also grown dramatically with the rapid expansion in global travel and trade since the industrial revolution. The problem is exacerbated by human-mediated ecosystem disturbance, and changes in the world's climate and biogeochemical cycling, which makes ecosystems more susceptible to invasion by alien species. Many introduced species provide enormous benefits to the country's socio-economic development, but a small and growing proportion have a net negative effect. There is ample scope for research towards understanding where introductions will have adverse impacts, and how these risks should be managed and regulated. Of the thousands of alien species that have been introduced to South Africa over the past 360 years, hundreds have become invasive. Those species that do invade can pose substantial threats to South Africa's ecosystems and the services that they deliver.2,3 They can reduce water supplies4, increase erosion5, exacerbate wildfires6, degrade rangelands7, threaten the health of people and livestock8, reduce productivity in agriculture9, and impact negatively in many ways on the country's remarkable biodiversity2. The economic damage caused by these invasions has been estimated at over ZAR9 billion per year10, and is growing as invasive species spread, and as more species are introduced and become invasive3,11. The imperative to address biological invasions has several drivers at international and national levels. South Africa is signatory to several international conventions, the most important of which is the Convention on Biodiversity. Article 8(h) of the Convention requires contracting parties, as far as possible and as appropriate, to 'prevent the introduction of, control or eradicate those alien species which threaten ecosystems, habitats or species'. The International Plant Protection Convention aims to secure coordinated, effective action to prevent and to control the introduction and spread of pests of plants and plant products. This agreement requires a single, national government authority to be in charge of specific responsibilities regarding phytosanitary control (in South Africa, this body is the Department of Agriculture, Forestry and Fisheries). At a national level, several additional policies imply a need to address biological invasions, including the 12 Presidential Outcomes, the National Development Plan, the National Biodiversity Framework of the Department of Environmental Affairs, and the Department of Science and Technology's 10-year Global Change Grand Challenge, all of which recognise the need to support sustainable development by protecting the environment from, inter alia, biological invasions. In 2004, the South African Department of Science and Technology (DST), through the National Research Foundation (NRF), established six inaugural Centres of Excellence (CoEs) after wide consultation and a highly competitive selection process. CoEs are physical or virtual centres of research which concentrate and strengthen existing capacity and resources to address issues of national and international importance, enabling researchers to collaborate across disciplines and institutions on long-term projects that are locally relevant and internationally competitive. The goal of CoEs is to enhance the pursuit of research excellence and to develop trained scientific capacity for the country. Internationally, the CoE model has become a common research funding instrument, having already been established in Australia, Canada and the USA. 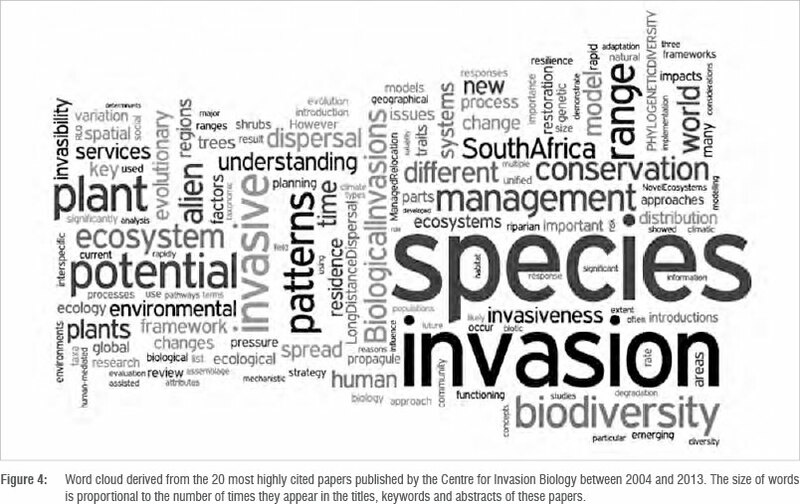 We present a brief review of the contributions of one of the six inaugural CoEs (the Centre for Invasion Biology, or C-I-B; www.sun.ac.za/cib) to the development of invasion science, following its first decade of activities. We examine the inputs that were required to establish the C-I-B, the outputs of research and training over the past 10 years, and the influence of this work in advancing the broad field of invasion science, and of implementing its findings in practice. These impacts are illustrated by means of examples at international, national and local scales. South Africa can be viewed as an extraordinary natural laboratory for the study of biological invasions. The country has been particularly affected by biological invasions for a range of reasons. There is a long history of colonial occupation, dating back 360 years, which has led to a large number of alien species being introduced. There is also a remarkable diversity of ecosystems, including mediterranean-climate shrublands (fynbos), karoo arid shrublands, grasslands, savannas, thicket and forest, rivers, estuaries, temperate and sub-tropical marine ecosystems, and remote offshore islands, all of which currently harbour populations of well-established and diverse invasive alien species and emerging invaders.12 The South African government allocates substantial funding towards the management of this problem.13 The combination of diverse ecosystems that all have particular suites of invasive alien species (some of which have been there for centuries) and well-funded management initiatives, has created particular needs for science-based solutions and trained capacity. The C-I-B has capitalised on this situation by initiating research across all of the country's varied ecosystems. Invasion biologists have to understand how natural ecosystems are structured and how they function, and how this structure and function is changed when ecosystems are invaded. This provides a novel 'lens' through which fundamental ecological questions can be viewed and addressed, and a unifying theme that can bring together scientists from different backgrounds. In addition, a focus on invasions requires research to extend beyond the narrower fields of biology and ecology, and to embrace sociological and economic aspects of the problem that must be understood to develop effective policies and management solutions. This has led to the scope of the work being broadened from 'invasion biology' to 'invasion science', and has allowed the C-I-B to develop unique solutions that have had impact at international, national and local scales. Unlike some of the other initial CoEs, the C-I-B was established de novo with the aim of providing the scientific understanding required to reduce the rate and impacts of biological invasions in a manner that improves the quality of life of all South Africans. The mission of the C-I-B is (1) to undertake research and education in the causes, effects and consequences of biological invasions for biodiversity and ecosystem functioning; (2) to remain at the forefront of research regarding biological invasions, biodiversity and ecosystem functioning by pursuing research excellence and interdisciplinary collaboration and by encouraging local, regional and international exchanges; (3) to enhance the national and international societal relevance of the C-I-B by producing high-quality, relevant research, and graduates who are sought after; and (4) to remain relevant to the needs of the community, focusing on South Africa in the context of trends shaping Africa and the world. Funding comes from a core grant from the DST, through the NRF, with substantial co-funding from Stellenbosch University as host of the C-I-B's administrative hub and partners. Additional funding is sourced through research collaboration agreements with a range of national and international sources, most notably the Department of Environmental Affairs' Working for Water Programme. directed at biological invasions as a primary focus, but also at climate change and other facets of global change, taking into consideration contemporary debates and discussions. The C-I-B has also recognised its duty to change the demographic profile of its students, in common with other CoEs and in line with broad government policy. The C-I-B has thus actively sought to attract students from historically disadvantaged backgrounds into the research and capacity-development programme. This has been challenging, as the broad field of biology is often not perceived as offering an attractive or lucrative career, especially among the target group of prospective students.14 Despite this perception, the C-I-B's graduates and former employees are employed in a broad spectrum of institutions and sectors within and outside South Africa, reflecting the diverse and high-level skills gained by invasion biologists. The management of biological invasions is complex, demanding a robust and holistic understanding of the many and varied aspects of invasion and its various stages, and of appropriate management responses to those processes. The C-I-B has adopted a research framework to guide the allocation of resources and to ensure that all facets of this complex problem are addressed effectively (Figure 2). 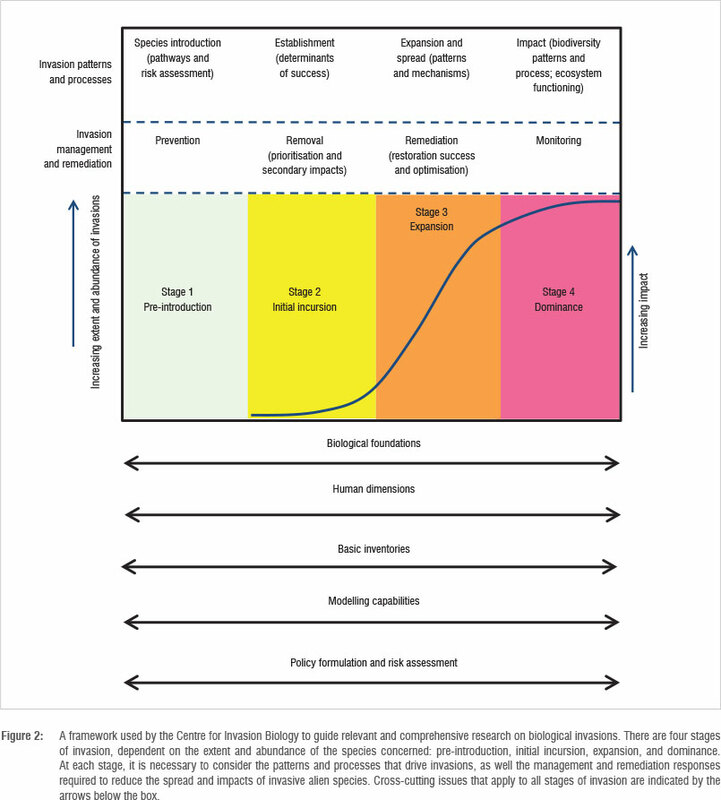 By engaging in a spread of activities across this framework, the C-I-B covers the full spectrum of research required to fully understand biological invasions and to explicitly link research outputs to the development of policy and the improvement of management. The C-I-B is centred at Stellenbosch University, with a second satellite hub at the University of Pretoria. The network of core team members is based at several South African universities and institutions. Over the life of the C-I-B, these institutions have included the Universities of Cape Town, Johannesburg, KwaZulu-Natal, Pretoria and Venda, Walter Sisulu University, the Council for Scientific and Industrial Research, the City of Cape Town, South African National Parks, the South African Institute for Aquatic Biodiversity, and the South African National Biodiversity Institute. This inter-institutional arrangement allows for a broad range of research interactions involving a wide diversity of research associates, postdoctoral fellows and students (Table 1). The C-I-B also collaborates with other organisations involved in invasion biology. Internationally, these organisations have included the Canadian Aquatic Invasive Species Network; the Institute for Biological Invasions at the University of Tennessee, USA; the Laboratorio de Invasiones Biológicas at the Universidad de Concepción in Chile; the Centre for Advanced Studies in Ecology and Biodiversity, Pontificia Universidad Católica de Chile; the British Antarctic Survey, Biodiversity and Macroecology Group, Department of Animal and Plant Sciences, University of Sheffield; and the Institute of Botany, Academy of Sciences of the Czech Republic. Other collaborators have included the Working for Water Programme of the Department of Environmental Affairs, Iziko Museums, the Flower Valley Conservation Trust, the Table Mountain Fund, the Drakenstein Trust and the Millennium Seedbank Project of the Royal Botanical Gardens at Kew. The C-I-B reports to a Board which currently comprises 14 members from eight South African and two international institutions active in the environmental and conservation fields. The C-I-B's research, education and training KPAs are assessed in two broad categories: publications and graduates. Research papers published in peer-reviewed journals are given prominence in the C-I-B's research KPA, where there is a requirement for a minimum number of such papers to be published annually. 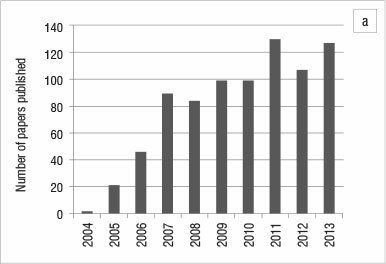 This target (currently set at 60 papers per year) has grown over time, but the actual output has always exceeded the annual target. 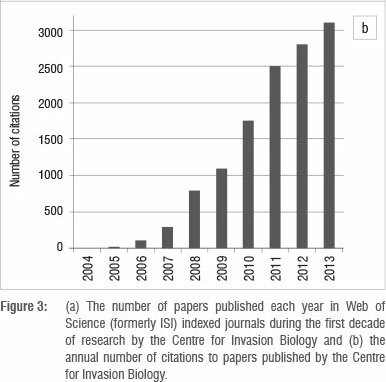 Since its inception, the C-I-B has, as of June 2014, published a total of 841 papers in Web of Science (formerly ISI) indexed journals, representing a significant contribution to global understanding in the field of invasion biology (Figure 3a). The impact of these papers is reflected in the >13 400 citations (Figure 3b), with an h-index of 52 (i.e. 52 papers have been cited 52 or more times each15). Invasive species feature prominently in these publications, which address a wide range of topics from evolution and ecological processes to conservation and management (Figure 4). 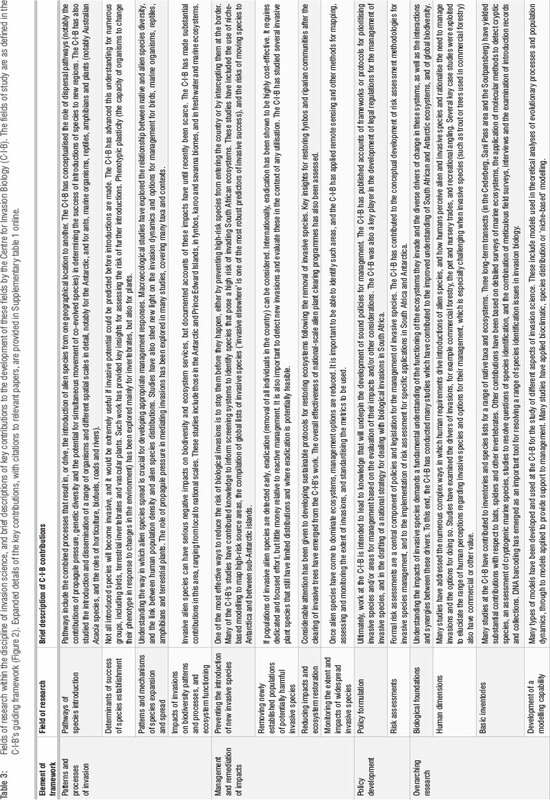 In addition to publications in the peer-reviewed literature, C-I-B activities have led to the production of several synthesis volumes and many semi-popular texts that have both increased understanding in the field, and raised awareness of the issue among a wider audience (Table 2, Figure 5). In 2004, the Invasive Species Specialist Group of the International Union for the Conservation of Nature (IUCN) published a list of '100 of the world's worst invasive alien species'31. Publications arising from the C-I-B have addressed 21 of these '100 worst' species (including one aquatic and eight terrestrial plants, four fish, two mammals, two birds, and two aquatic and two terrestrial invertebrates), indicating the wide coverage of research at the C-I-B. Graduates of the C-I-B have found employment in a wide range of sectors, including in government, science councils, parastatal organisations, NGOs, tertiary education institutions, and the private sector. There has thus been a growing contribution to human capacity in the field of researching and managing biological invasions, not only in South Africa but also in other African countries. Graduates of the C-I-B do not only provide capacity in the field of invasion science, they also raise awareness of the problem of biological invasions, and grow the discipline in their respective spheres of influence. The C-I-B has emerged as one of the leading institutes worldwide that conduct research on invasive species as their primary focus. 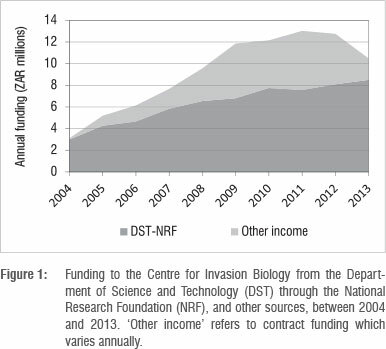 The research carried out at the C-I-B has been influential in shaping the global development of invasion science, as evidenced by the production of hundreds of publications that have been cited thousands of times (Figure 3, Tables 2 and 3). Some examples of the influence of the C-I-B's research at an international level are outlined here. Prince Edward Islands, make the country a key player in Antarctic policy relating to conservation and management practices. The C-I-B has conducted research for the South African National Antarctic Programme of the NRF and the Department of Environmental Affairs (DEA), as well as for international bodies.43,44 The research has addressed all levels of Antarctic conservation, from fundamental research to management planning and the production of handbooks for tourists.22,24,26 The research has been taken up in plans for protected area management and Antarctic Treaty System policy and position papers. The C-I-B (through its former Director, Prof. Steven Chown) also provided considerable service to the Scientific Committee on Antarctic Research (SCAR), by representing SCAR annually at the Committee for Environmental Protection (CEP) of the Antarctic Treaty System, and by ensuring that the CEP was provided with the scientific advice it solicits from SCAR and/or which SCAR considers significant for management of the Antarctic Treaty area. The C-I-B's research has also influenced many international policy documents. An example is the Fourth Global Biodiversity Outlook (GBO-4; www.cbd.int/en/gbo4) document prepared by the Convention on Biological Diversity. The technical background document provides the basis for the main GBO-4 report, to be launched in Korea in October 2014. Almost 10% of references cited in Chapter 9 (Aichi Target 9 - Invasive alien species) of this document were published by the C-I-B. The C-I-B has made substantial inputs to the development of policy relating to biological invasions in South Africa. For example, the C-I-B incorporated key research findings from its own programmes and from the international literature into the formulation of the regulations of the National Environmental Management: Biodiversity Act relating to alien and invasive species. Several core team members participated in a task team assembled by the DEA to develop objective, science-based lists of alien and invasive species; to compile a risk-assessment framework based on international best practice and advances in invasion biology in South Africa; and to participate in the drafting of the regulations. Outcomes from diverse C-I-B research were used in the process, and expert insights ensured that the regulations were grounded in international best practice from the fields of invasion biology and environmental management. Such impact is reflected in the overall structure and content of the regulations, which were published in January 201449, and are currently undergoing public review. In 2014, the C-I-B also co-led, with the Council for Scientific and Industrial Research, the development of a National Strategy for Dealing with Biological Invasions in South Africa. 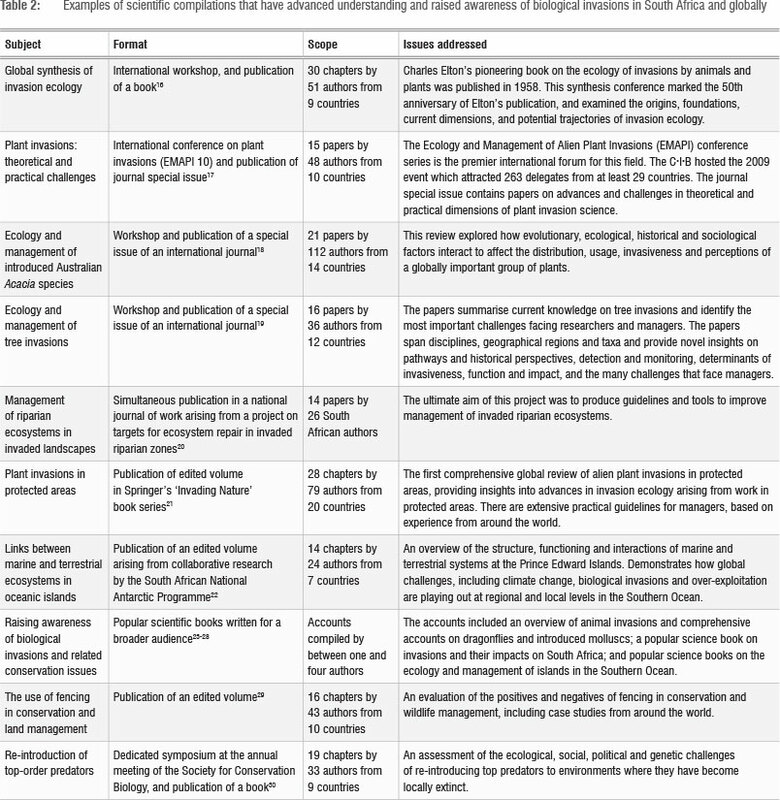 This comprehensive strategy, based on the inputs of 19 authors (more than half of whom were from the C-I-B) and numerous workshop participants, addresses all aspects of the management of biological invasions, covering all taxa and all stages of invasion. In developing this strategy, the C-I-B worked closely with the DEA to ensure that the best science-based practices were incorporated, while at the same time ensuring that these would be practically implementable in the South African socio-political context. The strategy is to be released shortly by the DEA. The C-I-B was also contracted by the DEA to review international best practice in the field of risk assessment for invasive species50 and to prepare guidelines for the implementation of risk assessment methods as part of national protocols for preventing the introduction of new invasive species. In 2008, the C-I-B was also involved in the development of an Invasive Species Programme within the South African National Biodiversity Institute (SANBI's ISP). One of the main aims of SANBI's ISP was to focus on incursion response (stage 2 in Figure 2). This unit, funded by the Working for Water Programme13 (the branch of the DEA responsible for managing invasive alien species), was designed to (1) detect and document new invasions, (2) provide reliable and transparent post-border risk assessments and (3) provide the cross-institutional coordination needed to successfully implement national eradication plans.51 The establishment of SANBI's ISP marks a substantial departure from historical practice, where the introduction of alien species was only considered insofar as it would affect agricultural productivity and human health, and where the impacts of alien species on the broader environment were only considered reactively. The C-I-B will continue to be a key research partner for SANBI's ISP, enabling them to meet their broader mandate of reporting on the state of invasion nationally, managing data on biological invasions, and coordinating risk assessments. The C-I-B is integrally involved in outreach activities aimed at developing interest, capacity and awareness in biodiversity and biological invasions. These activities range from exhibitions to training courses, providing expertise where it is requested, and learning lessons from real-life practice. In 2006, the C-I-B prepared a detailed management plan for the Prince Edward Islands.61 This plan, which was drawn up for the Department of Environmental Affairs, drew on the extensive knowledge that had been generated regarding the ecology of the islands.22 The plan covered administration, historical and conservation management, and waste management, and had a strong focus on preventing the introduction of alien species and the eradication of invasive species that had established on the island. Implementation of this plan has placed the management of these islands on a sound footing. The rationale for the establishment of a CoE for invasion biology, as for other CoEs, was to stimulate sustained research and to develop capacity, in a field adjudged to be of national importance. Both of these goals have been attained, as evidenced by the fact that set targets have been met or exceeded. The C-I-B has emerged as a leading institute in the global field of invasion biology, with several unique features that differentiate it from similar institutes that have a research focus. This includes a set of KPAs that required participants to embrace environmental, social and economic facets, leading to a diverse research programme and many integrated products. The make-up of the C-I-B (a managed network of researchers with diverse interests, spread over a wide geographical range) is another unique feature. Finally, the production of policy- and management-relevant research products arising from the engaged nature of research conducted by the C-I-B sets it apart from other similar research entities elsewhere. Much of the research has been designed to meet specific needs identified by resource managers with whom researchers have regular contact. 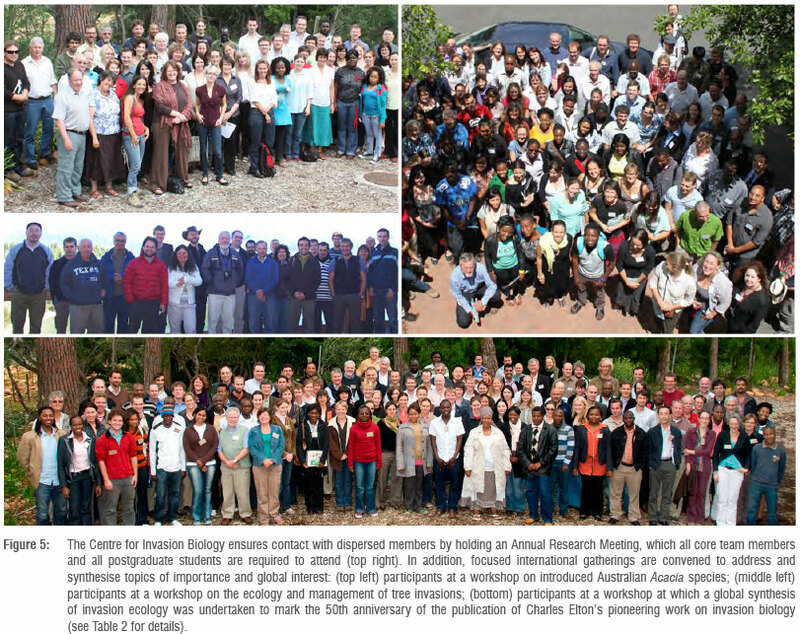 A mid-term review of the performance of the C-I-B, conducted by an international panel in 2009, identified several positive features.62 The review pointed to the emergence of the C-I-B as one of the most influential entities in the field of invasion science globally. The C-I-B was also seen to be leading the world in certain aspects of this field, for example, in tree invasions19 and invasions on the Antarctic continent43,44. The backing of the C-I-B's main host institution, Stellenbosch University, has provided an attractive location, excellent facilities and financial support, allowing the unit to establish a physical presence and a sense of identity. The output of the C-I-B, as measured by the publication of papers in peer-reviewed journals (the accepted primary measure of scientific productivity) was seen in the mid-term review as remarkable. This output has been substantially assisted by the maintenance of a large, active cohort of postdoctoral fellows and postgraduate students, who have contributed greatly to the research effort. The achievements of the C-I-B include a substantial contribution to the development of invasion science nationally and internationally, the training of scientists to address the problems of invasions, and increasing awareness among diverse sectors of society. As a result, South Africa is currently seen as a globally significant player in this important field. This review provides evidence that the CoE approach has been successful, and has made great strides towards understanding and managing invasive species - but substantial challenges remain. The C-I-B will continue to be active in this field for at least another 5 years. It is currently developing a strategy that will build on a solid foundation, and will find ways to continue its work in a sustainable fashion. The Department of Science and Technology provided the bulk of funding for the contributions reported on in this paper. This funding and other aspects of the C-I-B's operations were managed by the National Research Foundation. Stellenbosch University and the Working for Water Programme provided additional funding. We salute Steven L. Chown, founding director of the C-I-B, who provided inspirational leadership between 2004 and 2012. The C-I-B's core team members (other than the authors), past and present, are: Christian Chimimba, Steven Chown, Susana Clusella-Trullas, Savel Daniels, Colleen Downs, Karen Esler, Stefan Foord, Llewellyn Foxcroft, Mirijam Gaertner, Charles L. Griffiths, Cang Hui, Bettine Jansen van Vuuren, Steven Johnson, Johannes Le Roux, John Measey, Melodie McGeoch, Sue Milton, Heidi Prozesky, Victor Rambau, Mark P Robertson, Tammy Robinson, Mathieu Rouget, Michael Samways, Michael Somers, Peter Taylor, John Terblanche, Albert van Jaarsveld, Berndt van Rensburg, Olaf Weyl, John Wilson and Theresa Wossler. Richard Cowling, Eugene Cloete, Richard Duncan, Anne Magurran, Doug Rawlings, Tony Ricciardi and Paul Skelton provided comments on an early draft of this paper; Christy Momberg collated data and produced graphics; Dorette du Plessis sourced photographs; and John Wilson produced an initial framework on which Figure 2 was based.